Sapporo (札幌）  is the capital and largest city of the northern island of Hokkaido, Japan. One of Japan's newest cities, Sapporo's population has grown from seven in 1857 to nearly 2 million today. Being a new city, especially by Japanese standards, means it has little in the way of traditional architecture and the like of cities such as Kyoto. But what it lacks in "Japanese-ness" it makes up for with its lovely open, tree-filled boulevards to enjoy in summer and excellent snow and facilities in the long winter. 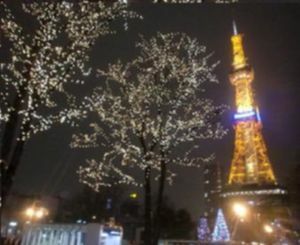 Sapporo has humid continental climate with wide temperature variations between summer and winter. Winters are cold, influnced by the Siberian Anticyclone, with an average temperature in January being -3.6°C (25.5°F) and features nights with temperatures around -7°C (19°F). Sapporo receives huge amounts of snow during wintertime, this being given to the frozen winds originating in Siberia, which gather up moisture from the Sea of Japan. It is, in fact, the second snowiest city of its size in the world, with the average year-round snowfall being 597cm (235 inches), almost 10 times that of New York City and 2.5 times that of Buffalo, the snowiest city in North America. It is only surpassed by Aomori, also in Japan in northern Honshu. In spite of that the record low is very mild for its latitude, being only -28.5°C (-19.3°F). Summers are warm and humid, with the average temperature in August, the hottest month, being 22.3°C (72.1°F) and days usually feature highs around 26°C (79°F). 30°C (86°F) readings are occasionally observed, but very hot temperatures are very rare. The highest recorded temperature is 36.2°C (97.2°F). The east Asian Monsoon, usually arrives in early August, dropping moderate to low amounts of precipitation, and ends in early October. Inarguably the best season to visit the city, and Hokkaido in general is spring or autumn. The cherry blossom usually occurs around April 10th. Sapporo is Hokkaido's main transport hub. The Tohoku Shinkansen, which currently runs from Tokyo to Aomori, is inching its way slowly towards Hakodate, with plans to eventually extend the line to Sapporo. Under the current schedule, bullet train service over the full Hokkaido Shinkansen to Sapporo will not open until 2031 - but when it does, the Hokkaido Prefectural Government claims that a travel time as low as four hours between Tokyo and Sapporo will be possible. Getting to Sapporo by train is time-consuming and expensive. Purchasing a JR pass is economical, if you're coming from Tokyo or anywhere in the south. Within Hokkaido, trains connect Sapporo to most major cities, including Hakodate, Otaru and Asahikawa. Trains run from Honshu to Hokkaido via the Seikan Tunnel. With a total length of 53.85 km (33.49 mi), the Seikan Tunnel was the world's longest railway tunnel until 2016, when it was surpassed by the Gotthard Base Tunnel in Switzerland. The Seikan Tunnel still claims the title of the world's longest tunnel with an undersea segment, with a 23.3 km (14.5 mi) section under the waters of the Tsugaru Strait. Perhaps the most popular way to reach Sapporo by train is on the various overnight sleeper services. These are popular, so book in advance. Note that for sleeper trains, the Japan Rail Pass only covers the basic fare. Pass holders are responsible for paying for the room and other surcharges. For example, a B2 room for two people on the Hokutosei costs ¥12,600, with up to ¥8,000 in surcharges. A free overnight option from Tokyo to Sapporo for Japan Rail Pass holders is to take the Shinkansen to Shin-Aomori and a regular "shuttle" train to Aomori, then take the Hamanasu (はまなす) express train to Sapporo. The one-way ride takes just over 11 hours, with arrival in Sapporo at around 6AM the next morning. The return trip to Tokyo takes 12 hours, owing to a longer layover in Aomori. Although Sapporo is located inland, there are two major ferry ports nearby: Otaru and Tomakomai. Both have scheduled car and passenger ferry service to points outside Hokkaido. 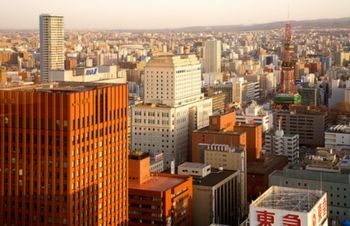 Most unusually for a Japanese city, Sapporo is logically organized thanks to its strict grid system. The main thoroughfare, the leafy Ō-Dōri (大通り, literally "Big Street"), runs east-west across the city and divides the city into North and South, while Sōsei-Gawa (創成川, literally "Creation River") divides the city into West and East, running under the main street Eki-Mae-Dōri (駅前道リ、literally "In Front of the Train Station Road"). The address of every block in the center is thus of the type "North X West Y" (prominently signposted at all intersections), making navigation a snap. However, most businesses etc. will still provide maps to their location, building names or landmarks, because the address "North X West Y" or the like simply means that the place you are trying to find will be somewhere in the block, and blocks in the centre of the city can be quite large! The city is eminently cycle-able, so the most economical and fastest way to get around Sapporo is undoubtedly on two wheels. While there is a complicated looking city bike scheme, there is also a large bike hire lot adjacent to the east wing of the station. It costs 500 yen per day and you are provided with a lock, all you need is your passport. For more information go and see tourist information in the west concourse of the station. The JR above-ground trains are reasonably priced and a good option for traveling in Sapporo and surroundings. The trains arrive and depart at specific times. You'll most likely want to take a train to and from the airport. Sapporo has three subway lines, all converging at Ōdōri Station at the center of the grid. The Namboku Line ("North-South") runs north-south, the Tōzai Line runs along Odori east-west. Only the Tōhō Line breaks the mold by running in a C-shaped curve from northeast to southeast. Single fares cost ¥200 and up, with a choice between subway-only tickets or transfer (subway, bus and streetcar) tickets. The simplest option is the With You stored value card (lowest denomination ¥1000). On weekends and public holidays, the Donichika-Kippu (ドニチカキップ) allows unlimited 1-day subway travel for ¥500. On weekdays, the One-Day Card allows the same, but costs ¥800. There is also a Bus and Subway Transfer One-Day Card, which allows unlimited 1-day travel on buses, subways, and streetcars (¥1000). Fares for children are about half those for adults. A streetcar of relatively little utility to most visitors trundles around the southwestern side of Sapporo, connecting to the subway at Susukino. Its most important stops are probably the Chuo Library (Main Public Library in Sapporo) and the Mt. Moiwa Ropeway. It's most useful in winter, when walking the icy footpaths to get to the library or otherwise less-accessible south-western areas of the city becomes quite treacherous. Single-trip tickets are ¥170. They also sell a "Do-san-ko Pass" on weekends and holidays which allows you to ride all you want for a day for ¥300. Since this is less than the cost of 2 normal trips, it is usually advisable to buy this if you are going to make a round trip on an eligible day. You could try to drive in the city, but parking might be problematic. Generally speaking, using the subways and buses is recommended. There are countless pay parking lots in Sapporo. One of the largest ones is about 100m south of the Susukino South Toyoko Inn, and it's a short walk from the subway. For those living in Japan who have an omiyage (souvenir) obligation to fill in your Japanese office when you return from your Hokkaido holiday, the best omiyage to buy in Sapporo is the ubiquitous Shiroi Koibito (白い恋人, "White Lovers"). It is a chocolate slice sandwiched in two wafers of sweet biscuit, individually wrapped and available boxed in a range of different quantities — tasty enough, but rather bland, and few Westerners would associate the taste with Japan. The original flavour is white chocolate sandwiched in plain sweet biscuit, but there is also a dark chocolate version. It's available in every souvenir store in the city (try the Sapporo JR area or Tanuki Koji Shopping Arcade when shopping for souvenirs), and also most souvenir stores around the island. Being a wintery kind of place for a good part of each year, Sapporo also has many stores selling all manner of snow goods. At the beginning and end of each season, many good deals on the previous year's gear can be found, often at discounts of up to 60% off, sometimes more! Also, there are several sports recycle stores in the city and suburbs where good deals on barely-used gear can be found, thanks to the Japanese fondness for having new gear every season. Ask Tourist Information to help you locate sports recycle and snow-goods stores. Sapporo is famous for hairy crab (毛蟹 kegani), an expensive treat available at any seafood restaurant, and miso ramen (味噌ラーメン), a more affordable local variation of the ubiquitous noodle dish with miso paste added to the stock. The ramen in particular will warm you up nicely on a chilly winter day. Sapporo soup curry (just what it sounds like) is also increasingly famous. As elsewhere in Hokkaido, you can also enjoy dairy products (milk, cheese, butter, chocolate and ice cream), seafood (especially as sushi), fruits (honeydew melon, strawberries) and meat (sausages, ham, bacon and beef). Kuwanomi (mulberry) is a popular fruit in Souen. This berry is red or black in color and sweet. Preserved kuwanomi can be made into jam, which is a traditional food. In elementary schools, students make kuwanomi jam every year. The drink of choice when in Sapporo is obviously Sapporo Beer, and a good option for this is the Beer Museum (see See). Susukino (すすきの), to the south of the center, is one of Japan's largest nightlife (and red-light) districts, originally created to keep labourers in Hokkaido. It has a somewhat unsavory reputation due to heavy yakuza involvement in the business, but is generally safe for travelers not actively looking for trouble. Get there on the subway Namboku line, Susukino station. There are a quite few internet cafes in the city, ask at the International Plaza (in Sapporo JR or near the Clock Tower) for current information and directions. Otaru, approximately 60 minutes by car (shorter by expressway). A very pleasant small town located on the coast, and famous (within Japan) for its attractive canal which is very European in design. Also famous for its seafood, music box museum (with associated tourist shop) and glass works. Also famous for being the setting of the movie Love Letter. Niseko, arguably Japan's top destination for powder skiing and snowboarding, is two hours away by bus. The hot springs and mossy canyons of Shikotsu-Toya National Park are within easy striking distance of Sapporo. Asahikawa's Asahiyama Zoo  is the most famous and most visited zoo in Japan, even though it's in the middle of nowhere (at least a two-hour trip from Sapporo). Its most famous exhibits are the penguins which walk around the park twice a day (THE must see for all the Japanese who find this immensely cute), and the seals that you can see swim vertically through a large transparent pipe. It also features polar bears, wolves, Japanese deers, big cats, different kinds of monkeys and more. It's most impressive in winter when it's covered in snow (have you ever seen a giraffe walking in snow?!) but a few of the exhibits are also closed during this season. This page was last edited on 12 April 2019, at 06:27.